Secret World Legends launches today, a free-to-play reimagining of Funcom’s 2012 Lovecraftian MMO The Secret World. Secret World Legends streamlines a lot of the game’s core systems to make it more action-oriented and player-friendly. These changes let the story, always the game’s best feature, take center stage. I came late to The Secret World, in 2014, at the advice of friends who stopped playing shortly after I started. I’d never been much of an MMO person, and I’ll admit the builds and stats and gear effects overwhelmed me. Secret World Legends bills itself as a “shared-world action RPG” instead of an MMO, which means a lot of the nitty-gritty has been done away with. I revisited the game’s starting area of Kingsmouth, Maine, over the weekend. There are certain features I missed, mostly because I’d grown to love some of The Secret World’s clunkier bits. But Secret World Legends is easier to jump into than its predecessor, which makes it more welcoming to new players and less frustrating for returning ones. Here are some of the changes. You can still create any combination of skills you want, but now you pick a class in the character creator. This class determines your starting weapons. Switching it up by unlocking new weapons costs Marks of Favor, which you get by completing daily challenges, or Aurum, which is currency purchased with real-world money or traded for in the marketplace. Unlocking new weapons can be done without spending any real-world money, but it will take you a while. Players with existing The Secret World accounts can link their account to Legends, which allows you to start with all the weapons unlocked. I never went in much for the builds in The Secret World. My more experienced MMO friends either told me what to do, or I grabbed guides from the internet. Secret World Legends still has depth, but there’s less synergies to worry about. I’ve felt more efficient off the bat, which has let me get out of the menus and into the game. You also use the number keys less, with your abilities bound to Q, 1, 2, E, and the left and right mouse buttons. I bound my most frequently-used attacks for my primary and secondary weapons to my mouse buttons and went to town. It felt much less clunky than when I first started The Secret World. I don’t know if it’s just that these tweaks gave me something I’m more familiar with, but combat so far has felt easier. The fire station, which wrecked me the first time I played, was still a challenge for my low-level character, but it wasn’t nearly the bloodbath I remembered from my first time with it. Speaking of levelling, Secret World Legends has actual levels, which you proceed through as you kill enemies and finish quests, earning XP and points to put into abilities along the way. The game tells you the level of an enemy you’ve come across, as well as the recommended level of a quest you might take on. For instance, my current story quest won’t let me proceed until I hit Level 12, which means I’m busy sidequesting back and forth across Kingsmouth until I can continue. It’s a big change from The Secret World, but it’s definitely kept me from unintentionally going into areas I shouldn’t. It’s another addition that makes the game a little easier to understand. 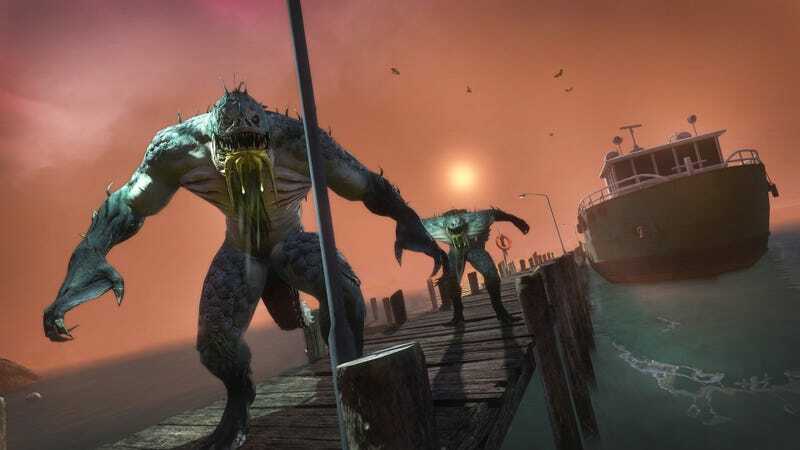 I miss some of the surprise (one of my favorite memories from The Secret World was accidentally kiting a mob of high-level monsters up and down a road while two other players watched on bemusedly), but it’s also made progress easier to evaluate. Upgrading and crafting in The Secret World was pretty complicated, involving toolkits, ingredients, and arranging things on a grid. In Legends, you simply add unwanted gear to existing gear in the upgrade menu, which will boost the stats of weapons and wearable items. It’s simple, though I’ll admit to missing my stacks of toolkits. While some monsters have dropped loot in Kingsmouth, it’s less common than before. Instead of choosing your gear reward, you get loot bags from completing quests. The loot you get seems bound by area—I’ve gotten the same waist talisman over and over. It’s taken some of the random fun out of loot and, while it’s made gear management easier, it’s also made it a little less exciting. While not strictly gear, it’s worth noting that clothing is no longer purchased from stores. Instead, you buy it straight from your dressing room, which you can access anywhere via your character sheet. The useless stalls in London made me a little sad, but don’t worry: you can still buy tacos. One of my favorite new additions is the changes to Agartha, the game’s travel hub. It functions more like London used to, full of shops and social spaces. There are terminals with people looking for raids and cabals, and even a dance club. It looks awesome and makes Agartha feel more like the world-inside-the-world it’s supposed to be. I’ve spent a lot of time hanging out in it, eavesdropping on players in general chat and trying to remember my emotes. The tutorial has been overhauled, with a new area that teaches you a few more things before you get to your faction. Overall, the streamlining of the game’s mechanics means there’s less in the way of the story, which was always the game’s best feature. The strange world, memorable characters, and complicated quests become the real stars. Even though I’ve played all these missions already, it’s been fun to revisit them with fresh eyes and less character management to worry about. The fact that I know the answers to most of the investigative quests doesn’t hurt, either. Secret World Legends feels easy to just pick up and start playing, letting you focus on its world and story rather than running to a wiki every time you get new gear. For new players, who might have been curious about The Secret World but turned off by its mechanics, it’s a great change. The Secret World players who’ve done all there is to do in the old game might not get many new experiences out of it. I haven’t played The Secret World for a few years, but all the changes have gotten me curious again and have meant it’s nice to be back. Also, Kirsten Geary is still an awesome weirdo.